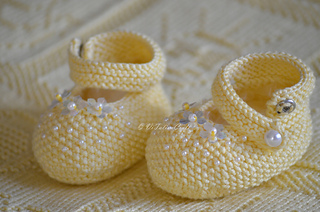 This knitting pattern is for my Yellow Pearl Baby Booties. These tiny booties are so beautiful and easy to knit. They are decorated with flower sequins and tiny pearl beads. 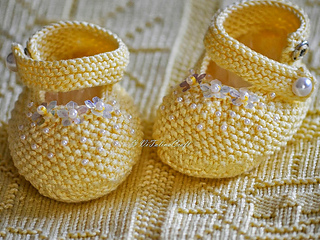 The booties are knitted in the round so they have no any seams. I made the baby booties in bright yellow color using Rowan Siena 4-ply 100% Mercerized cotton shade 00657 but actual color and type of yarn can be varied. 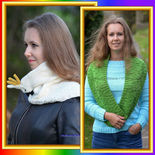 My knitting pattern is easy to follow and suitable for beginners. It contains written row-by-row instructions and picture. The pattern is written for one size: 0-6 months.